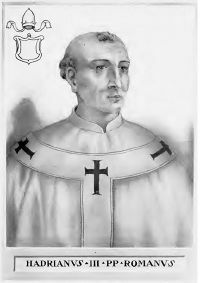 Pope Adrian III (also known as Hadrian III) was Pope from May 17, 884 to September, 885. Although he was canonized in 1891, relatively little is known about the details of his life. However, to have achieved the highest office in the Christian world at that time suggests that he was a man of ability and that he enjoyed a high degree of support. The papacy was coveted by many prelates at this time, as it would be later in history and was largely in the gift of the aristocratic families of Rome. Bishoprics were bought in order to contest election. Some sources suggest that Adrian was the candidate of a faction what opposed the corrupt practices of the aristocratic faction. This, if true, may explain the brevity of his reign. Summoned to Germany by the Emperor, Charles III the Fat within two years of his consecration, he died en route. He may have been assassinated by his enemies. So little is actually known about this Pope that it raises interesting questions about the accuracy of much of the information that is available at this period. It has been suggested that the records tell us an "official" version, and that what the Church later found embarrassing is missed out. Just 25 years earlier, it is possible that a woman, Pope Joan (known as Pope John) occupied the papal throne (between 853 and 855) but if she did, any reference has been expunged. The paucity of information on Adrian III is typical of the lack of detailed biographical data on many of the Popes from this period. He was born in Rome. At this time, Popes were elected by the people and clergy of Rome and almost all of them served from a young age within the papal establishment. Presumably, Adrian worked his way up through the ranks. He may or may not have been a Cardinal before his election. He was obviously popular enough to be a candidate for the papacy, although money was not uninvolved in the process at this time. There is, however, no evidence that he engineered the election. One source refers to his "having aided the Romans during a famine," which could explain his election to the papacy. We do know that he was elected Pope May 17, 884, although the circumstances are "shrouded in obscurity." His pontificate of less than two years was set firmly in the context of the political reality of the day. When Leo III crowned Charlemagne as Holy Roman Emperor in 800 C.E., in theory, he did this as successor to the Roman Emperors under the terms of the alleged will of Constantine I. In reality, however, the Pope reigned under the patronage of the Emperor, not vice-versa yet the Emperor also needed the Pope's recognition, so the relationship between Pope and Emperor was complex. Certainly, the Pope was vulnerable to attack, lacking his own army. However, the title 'Emperor" had been gifted by the Pope, and required papal sanction. At this time, kingship was itself understood as a sacred trust, thus only a sacramental act could confirm a king's right to succeed. The major problem at this period was that Charlemagne was a Frankish king, and under Frankish law the kingdom did not pass to one son, but was sub-divided among all of them. Succession to the title of Emperor was not regarded as an automatic right on behalf of the elder son but was open to competition. In the years following the death of Charlemagne's son, Louis the Pius, who died in 814, the territory ruled by his heirs grew smaller and competition among them for land and for the imperial title, grew stronger. Most of the Popes from Leo III onward spent much of their time supporting one rival against another and trying to position the Papacy in the most advantageous position, that is, one that strengthened the papal claim to temporal as well as spiritual authority. Adrian appears to have set himself the task of ridding the Roman system of corruption. He arrested the leader of the aristocratic faction, Bishop Formosus. Since the Roman aristocrats at the time saw the papacy as theirs by right, to be shared around the patrician families, this could have been reason enough for Adrian's murder. The sale of ecclesiastical office was lucrative, and the life-styles that some prelates lived resembled those of Rome's more indulgent emperors rather than that of Jesus of Nazareth, who "had nowhere to lay his head." One source says that Adrian had George of the Aventine, a member of the Formosun group and notorious for several murders he committed, tried, condemned, and blinded, and had a widow of one of the opposing nobility whipped naked through the streets of Rome.". McBrien locates these acts in the context of the "bloody vendetta" sparked by the assassination of Pope John VIII (the first Pope to be murdered) in 882, which was itself shrouded in mystery. McBrien writes that "None of the sources indicates a reason for his murder." As with several popes from this period, Adrian wanted to maintain cordial relations with the Patriarch of Constantinople and informed him of his election. It fell to Adrian III to confirm or to deny Charles III's right to pass on the imperial title to his illegitimate son. If, as McBrien reports, Adrian II wrote a "four volume history of Charlemagne," then he was well informed in contemporary politics. Charles III, or Charles the Fat, a grandson of Louis the Pious by his third son, Louis the German. Sources indicate that it was Charles who "summoned" the Pope to attend him at Worms, in modern Germany. This itself indicates who considered himself to be in the superior position. According to McBrien, Adrian may have decided to rule in favor of Charles's son in return for Charles' support in his own struggle in Rome. Sources also suggest that in addition to confirming his imperial title, the threat represented by the Saracens, who by this time had a foothold in Spain, was on the agenda. Adrian died while en route to Worms in September, 885, at Modena. Mystery surrounds the circumstances. He may have been assassinated; McBrien says that he "seems to have met with foul play." Adrian III was buried in a monastery at Nonatula, where, writes Loughlin, "his memory has ever since been held in local veneration" although the reason for this is unclear. Possibly, the fact that he was Pope was sufficient reason. Adrian III held the highest office in Western Christianity at a time when Europe was internally vulnerable due to rivalry between the heirs of Charlemagne, and when the threat of invasion by the newly emerging Muslim empire was also on the horizon. Given that the record books tell us very little about Adrian III, it is difficult to assess his legacy. However, he was canonized on June 2, 1891. His feast day is July 8. If Adrian did treat his opponents as harshly as the source cited above describes, it is difficult to understand why he is considered a saint. On the other hand, such punishments were common place at the time. The source cited says that little is known as to "why he is venerated as a saint." ↑ Donna Woolfolk Cross, Pope Joan, (NY: Ballantine, 1996, ISBN 0345416260). This is a well-researched work of fiction that contains a great deal of information on the papacy at that time. If Joan did exist, she, too, appears to have set herself over-and-against the corrupt practices of the day. ↑ 2.0 2.1 Saint Adrian III Encyclopædia Britannica. Retrieved August 14, 2018. ↑ 3.0 3.1 3.2 3.3 3.4 3.5 Richard P. McBrien, Lives of the Popes: The Pontiffs from St. Peter to John Paul II (San Francisco, CA: HarperSanFrancisco, 1997), 142-143. ↑ St Adrian III Catholic Online. Retrieved August 14, 2018. ↑ Pope St Adrian III Catholic Encyclopedia. Retrieved August 14, 2018. This page was last modified on 20 August 2018, at 21:43.